Reforming Southern Europe: How to Square the Triangle of Employment, Fiscal Austerity and Inequality? Mass unemployment is probably one of the most worrying features of the Eurozone crisis. As youth unemployment is hitting record levels (one in four people under 25 in Europe and more than one in two in Spain are officially out of work), many observers are warning against the rise of a “lost generation”, especially in Southern Europe. The European central Bank and international financial situations may have developed an obsession for deficit and debt reduction, but mass unemployment can be considered a much more worrying problem in the long term for both workers and governments. For workers, skills deteriorate when they are out of work, and as technology goes forward, their likelihood of finding a job tend to decrease with the duration of unemployment. For governments, each period of mass unemployment tends to increase the incompressible threshold of structural unemployment. When the number of unemployed increases en masse, it is very difficult to come back to the initial level even in the case of an upturn, as many workers driven out of work for too long are never able to come back into employment again. The problem is even more serious when unemployment concerns primarily young people at the beginning of their career, who cannot even start climbing the ladder in the first place. In this context, what can governments do, and how do different types of reform impact on public deficits and inequality? In the late 1990s, political economists have argued that service economies, where economic and productivity growth tend to be much lower than in the past, entail a “trilemma” between high employment, low inequality and budgetary restraint. Following this idea, governments in service economies have to choose two out of these three objectives, as all three of them cannot be reconciled. For many Continental European countries with so-called “Bismarckian” welfare states such as France, Germany, Italy or Spain, the common wisdom is that employment has often been sacrificed to reduce inequality and – often unsuccessfully – contain taxation at the same time. Redistribution is funded through payroll contributions levied on wages rather than by general taxes, which tends to price out low-skilled workers. The amount of contributions employers have to pay even on low salaries can make them too expensive, and earnings-related benefits and minimum wages possibly prevent the entry of low-skilled workers. In Mediterranean countries like Spain, Italy, Greece or Portugal, the problem also often emphasised is the rigidity of labour laws which tend to protect the “insiders” – people who have entered the labour market in the period of growth in the 1960s to 1990s, making it harder for new entrants to get in. The result of this is that young people are much more affected by unemployment in spite of the fact that they are typically much more qualified than their parents. On top of this, poor childcare inherited from a strong *male breadwinner” bias combined with the loosening of family structures typically hampers female employment in Southern Europe: in 2012, only 54% of Spanish women and 50.5% of Italian women between 20 and 64 were in employment (64% and 71 for men respectively). The corresponding figure for Denmark was 72.2 (females) and 78.8 (males). Even considering lower employment rates in general, the gender gap in employment is typically greater in the South. The first strategy governments can pursue to increase employment while keeping a lid on public expenditure is the Anglo-Saxon way, namely mass deregulation to price in workers again at the bottom of the labour market. It is also the one that is being pushed by European institutions, Germany and the current Spanish government. By cutting down payroll contributions and benefits, what is sought is the expansion of the labour market downwards, through low wage-jobs. It is understandable that Germany is pushing for this kind of solution because it is the strategy that it has pursued itself since the early 2000s, with the rise of mini-jobs, the Hartz reforms and a deliberate strategy of wage compression by German trade unions. The obvious direct consequences of this strategy are the higher income inequalities typical of Anglo-Saxon economies. Income inequalities in Germany also seem to have increased considerably in recent years in spite of the “jobs miracle”. It is unclear, however, whether deregulation is really able to increase employment across a wider set of countries. Moreover, the internal devaluation strategy pursued by Germany to boost exports and run a positive trade balance can only work if other countries run a trade deficit: we cannot all be Germans at the same time. The second strategy is the Scandinavian way. It consists in the massive expansion of the public sector to provide a wide variety of social services funded by high levels of taxes. Countries like Denmark, Norway or Sweden tend to have higher employment levels at least in part because the state provides or subsidises a large variety of quality social services such as childcare, which not only employ a large workforce, but also tend to facilitate female employment. Affordable childcare allows both members of households to be employed, while its absence often forces a member of South European households – typically the woman – to choose to stay at home. Moreover, theses countries invest massively in active labour market policies. Obviously, the price to pay for this strategy is very high levels of taxation to fund the state, or alternatively, an increase in borrowing. In the context of fiscal austerity that pervades almost all European countries, this is politically very difficult, or even impossible. Countries like France, however, still have large programs of publicly subsidised employment for young people. In 2013, a quarter of jobs held by people below 25 were partly subsidised by the state. If deregulation creates inequality and is not guaranteed to work, while public sector expansion is very expensive, what is left? In a forthcoming book chapter with Jelle Visser, we argue that there may be a third “liberal-corporatist” way based on the experience of countries such as Switzerland and the Netherlands, where employment participation is high, inequality is low to moderate, and the public sector is nowhere near the size of Scandinavian countries. This model relies on the widespread use of part-time employment and strong systems of occupational skills lifting wages in the bottom of the labour market. 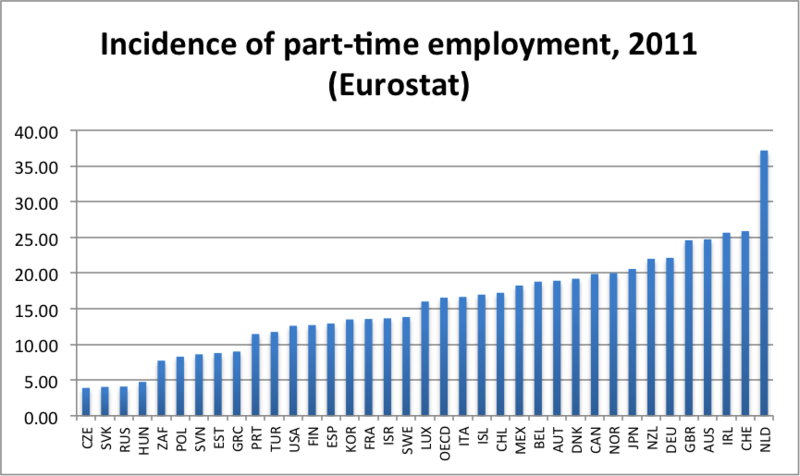 The Netherlands and Switzerland have the highest incidence of part-time employment in the OECD, and Switzerland has one of the lowest income inequality levels in the OECD in spite of the fact that it redistributes as little as the United States. In a context where public sector expansion and extensive subsidised childcare as found in Scandinavian countries are politically difficult to put in place, the increase of part-time employment has been a private response allowing women in particular to reconcile childcare with labour market participation. 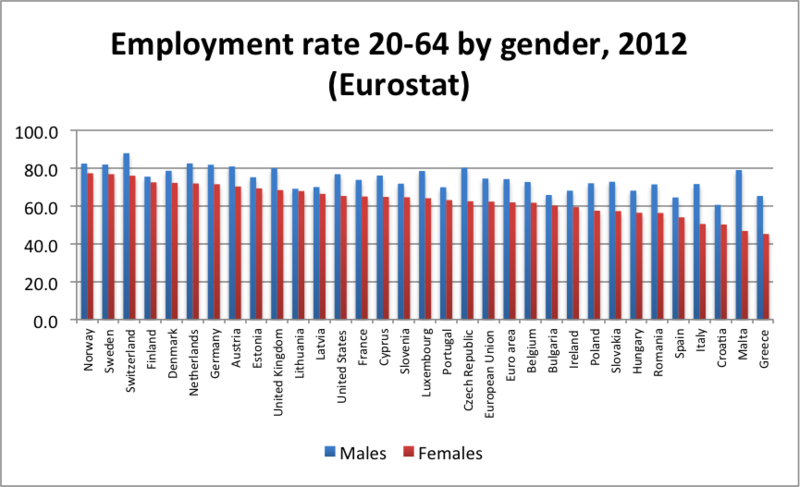 Interestingly, the places where the Dutch and Swiss social models perform particularly well are those in which Southern European countries are lacking, notably for female, elderly, and youth employment. The latter is largely due to strong systems of vocational training which ensure a better transition from school to work, so that the alternative is not only between dropping out of school with low skills or going to university, a system which also tends to foster income inequalities. In all these respects, they can represent a politically viable way to escape the trilemma outlined above at a lower cost in terms of public finances and inequality. Of course, any supply-side reform agenda is constrained by the availability of demand, which is a massive problem in Southern Europe. Governments are cutting spending at a time when households are reducing their consumption. Supply-side reforms are of little incidence if nobody at home or abroad is buying anything. In Switzerland and the Netherlands as well, high employment has been underpinned by some form of demand-stimulating factor whose sustainability is uncertain. In the Netherlands, tax exemptions on mortgages have encouraged ever-inflating house prices and the highest levels of mortgage debt in Europe. At the moment, the country has fallen in recession, and the government has cut spending at a time when households are seeking to reduce their debt level. In short, while the Dutch government was a harsh advocate of austerity in Southern Europe, it finds itself entrapped in the same kind of “balance-sheet recession” that Spain is facing. In Switzerland, domestic demand has been maintained by very high levels of immigration since the mid-2000s, compensating for declining exports due to the appreciation of the Swiss franc (as a consequence of the depreciation of the euro), and anaemic demand in the Eurozone. The sustainability of this strategy can be questioned as well, as population growth cannot be pursued indefinitely. This article was first published under a different title on the LSE’s EUROPP blog, and will be published in Spanish by Agenda Publica. This entry was posted in Austerity, Corporatism, Eurozone Crisis, Welfare and tagged employment, equality, Greece, Italy, Portugal, Spain, Welfare on December 17, 2013 by alexandre afonso.